Are you looking for ways to get more out of your existing autoclave? Maybe you’ve noticed that your production is slowing down and you need to speed up your processes. Or perhaps you need a way to lower your margins and make your business more profitable. All you need to do to fix your problems is find a “good” used autoclave, make an offer, arrange for shipping, and install it, right? In the case of used autoclaves, the saying couldn’t be truer! So, what exactly do you need to look at before purchasing that used autoclave? Was the autoclave heat-treated when it was manufactured? Is the autoclave rated for the pressure I want to work at? Does the track gauge inside the autoclave match the track gauge at your facility? Are the autoclave’s steel supports designed for the weight of the loads you are going to process inside the autoclave? Used autoclaves are usually referred to as a “non-fired pressure vessel” in state laws and guidelines. And yes, these requirements apply to both new and used pressure vessels. 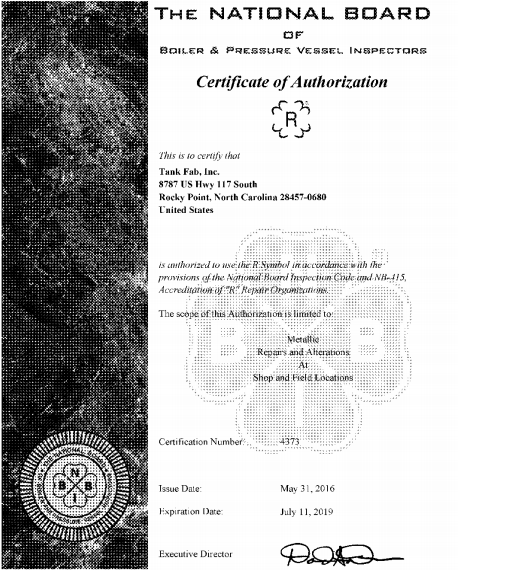 Almost every state in the U.S. has some form of pressure vessel law. As a minimum, most states will require that you have a copy of the Manufacturer’s Data Report for the autoclave. They will also require that a third-party inspection agency, which sometimes is a state representative, inspect the tank before it is placed into service. Without a copy of this report, the probability is very high that the state will not allow you to use the autoclave. There are a few ways that you can obtain a copy of the data report. Always ask the seller of the used autoclave if they have a copy. If they don’t, your next step is to see if the autoclave was registered with The National Board of Boilers and Pressure Vessels. You can determine this by having the seller provide you with the autoclave Manufacturer Data Plate Information. Many sellers will have no idea what you are asking for so a bit of education may be required at this point. What is the Manufacturer’s Nameplate Data? 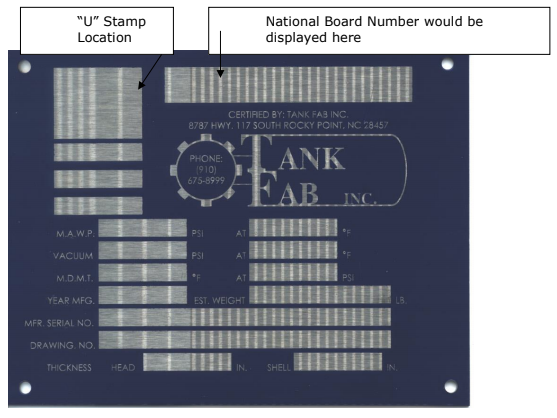 When a tank is manufactured per the ASME Code, it is required to have specific information, known as the Manufacturer’s Nameplate Data, permanently affixed to the tank. This information will either be on a steel nameplate attached to the autoclave or may be stamped directly into the shell of the autoclave itself. While there are no strict rules as to where this information should be located on the autoclave, most manufacturers place this information somewhere near the autoclave door’s manual safety lock mechanism. If the autoclave was registered with the National Board, a National Board Number will be stamped into the data plate. Sometimes the number will be referred to in the data as the National Board Number, NB Number, or Natl Brd No. Here’s an example of our Manufacturer’s Name Plate. If a National Board Number is listed on the Manufacturer’s Nameplate, you can contact the National Board’s record department and get a copy of the Manufacturer’s Data Report. You will need to tell them the name of the manufacturer, the year the autoclave was manufactured, the National Board Number, and the manufacturer’s serial number. The National Board’s phone number is 614-888-8320, and their website is www.nationalboard.org. Tip: A list of each state’s boiler and pressure vessel office is listed on the National Board’s website. These are the officials you will need to talk to about using your used autoclave in their state. What if you have the Manufacturer’s Nameplate Data, but no National Board is listed? Your next step is to contact the manufacturer of the autoclave itself. While it isn’t required that the manufacturer keeps a copy of the Data Report, many companies do keep a copy in the autoclave job file. If the manufacturer doesn’t have a copy of the report – or worse, the manufacturer is no longer in business – your only other option is to ask the state for an exemption. Depending on how the state’s law is written, the state’s Chief Boiler Inspector may have the right to issue you an exception for using the autoclave. Usually, an exemption will require some Non-Destructive testing of the autoclave which can cost thousands of dollars to perform. Also, keep in mind that the autoclave will need to pass the tests to be granted the exemption. Without passing the tests, unfortunately, you will own nothing more than a somewhat large boat anchor that you may be able to use – if you can get the Department of Natural Resources to allow its use as a boat anchor. If there is no “U” stamp on the autoclave, you will be unable to use it as an autoclave if your state has pressure vessel laws. Here’s what a “U” stamp looks like. You’ll find it with the Manufacturer’s Name Plate Information. As discussed in Step #1, the autoclave will have the manufacturer’s Nameplate information either on a nameplate or stamped into the autoclave material. This information will also be listed on the Manufacturer’s Data Report. Just be sure that the nameplate information and data report information match each other. This test should be performed on the autoclave’s shell, head, and door, and it will give you an idea of how much usable life is left in the autoclave. According to the ASME code, to which these autoclaves are manufactured, this autoclave can be safely used at its rated maximum allowable working pressure, until the corrosion allowance has eroded away. Once the corrosion allowance is depleted, the autoclave will have to be used at a lower working pressure to comply with the pressure vessel laws of your state. A non-destructive testing company can perform this test for you. The cost of the test is dependent upon the size of the autoclave. Tip: When asking for pricing for the test, be sure to indicate that you would like the test performed in accordance with Section 5 of the ASME Code. While this is not required, many testing companies do not charge additional for this, and it may help you in gaining approval from the state’s Chief Boiler Inspector for the use of the autoclave. How do you know what the “corrosion allowance” is for the autoclave? It will be listed on the Manufacturer’s Data Report. Let’s say you have a copy of the autoclave’s data report and the ultrasound test has shown that you’ll get the useful life you need out of the autoclave. The state has also approved its use. There are a few questions you should ask before signing that purchase order. Some autoclaves that are manufactured require heat treatment. It depends on what the autoclave was initially designed for, but in some cases, the purpose requires the autoclave materials be heat-treated or stress-relieved. How can you tell if the autoclave you are looking at has been heat-treated and why does this even matter? You can tell by referring again to the Manufacturer’s Data Report. You can also tell by looking at the Manufacturer’s Name Plate information. The letters “ST” or “HT” would be listed in the info if the autoclave was heat-treated. It’s important to know because, if you repair or alter the autoclave in any way – such as adding a new nozzle or replacing the interior tracks – it will need to be heat treated once the repairs are done. Heat-treating is neither easy nor cheap to do! The autoclave will have to be heated until the tank’s material reaches the required temperature and time, as defined by the ASME Code. In the case of carbon steel, the code requires a minimum temperature of 1,100 degrees Fahrenheit. This temperature must be maintained for a minimum of one hour. The cost to have this done can range from $15,000 to $70,000! You’ll also have to consider the damage that may occur to the autoclave door(s) if it’s not properly prepared before heat-treating the autoclave. The autoclave’s Maximum Allowable Working Pressure (MAWP) is listed both on the Manufacturer’s Data Report and the Nameplate information attached to the autoclave. As discussed in Step #4, the MAWP is the maximum pressure you can use in this autoclave. A common misconception many have is that you can work at this pressure. Unfortunately, that is not correct. The MAWP is the pressure “limit” of the autoclave. Whatever the MAWP is, the pressure relief valve must be at full open when the pressure inside reaches the autoclave MAWP. In fact, the pressure relief valve will begin to open before it reaches this pressure limit. Most pressure relief valves will be set to start opening at 10% less than the MAWP. Therefore, the maximum pressure you could work at inside this autoclave would be 201 psi. Tip: Be sure to check to see if the autoclave is rated for use under vacuum. Not all autoclaves are designed for vacuum service because the vacuum wasn’t a requirement for the process the autoclave was designed for. If the autoclave is rated for vacuum service, where do you think you could find that out? That’s right! The Manufacturer’s Data Report and the Nameplate information. Tip: If the autoclave is not rated for vacuum, many times it can be, but a National Board alteration will need to be performed to the autoclave. This work will need to be completed by a company holding the National Board “R” stamp. Does the autoclave include a set of tracks for loading the product into and out of the autoclave? Track gauge is defined as the distance between the inner faces of the load-bearing rails. For example, if the tracks within the autoclave are manufactured from structural steel angle, the tracks gauge measurement would be the distance between the vertical legs of the angles. Your facility’s existing track gauge must be the same distance as what is found in the autoclave. If it isn’t, you will need to cut the tracks out of the used autoclave and install a new set. Doing this is considered a National Board repair within the National Board Code. This means your state laws governing the use of the autoclave will require that this repair is completed by a company that holds an “R” stamp and is qualified by the National Board to perform this type of work. A National Board “repair” is defined as any work performed on a pressure tank that does not change the original design intent of the tank. An example of this would be replacing tracks inside the autoclave, or adding another 4-inch flanged nozzle to a location where this same nozzle already exists. A National Board “alteration” is defined as any work performed on a pressure tank that does change the original design intent of the tank. Tip: A word about companies holding National Board “R” stamps. Not all companies holding “R” stamps are qualified to do repairs, alterations, or both. The company’s quality control system must be written to where they can perform either repair, alterations, or both. Then the company must demonstrate their quality control system to the National Board to qualify to do this type of work. Another point of note is that not all companies are qualified to perform repair and/or alteration work in the field. The easiest way to determine if the company is qualified to perform the work you need is to ask for a copy of the company’s current “R” Certificate of Authorization. The certificate will list what type of work the company is authorized for. Examples of this would be a new support system for the tank or adding a nozzle where no nozzle of similar size or shape existed before. Not all loads are the same! The weight of a load of poles treated with Chrome, Copper, and Arsenic (CCA) is much different than a load of railroad ties treated with creosote. Be sure that the weight of the load you are planning on processing inside the autoclave will not overstress the used autoclave supports. New supports can always be made to eliminate this issue, but this work will be considered an alteration by the National Board. The dangers of buying a used autoclave are significant. Purchasing a used tank that doesn’t meet your state’s requirements could cost you, and in some cases, may result in you not being able to use the autoclave as a pressure vessel. Remember the boat anchor analogy above? In the end, it’s often better to invest in a new autoclave – one that you can build to meet your company’s unique requirements and needs. To recap, here’s a look at the perks of investing in a new autoclave versus a used one. State and/or Insurance Company Requirements Meets only some requirements. Is designed to meet all requirements. Is designed, manufactured and tested in accordance with ASME Code Used autoclave may have met these requirements, but the data plate and/or manufacturer’s data report, which proves it met these requirements, is missing. Each new autoclave we manufacture meets the ASME requirements. Also, we also register the autoclave data report with the National Board. That way if you ever lose your copy, you can contact them to obtain a copy. Autoclave Vacuum Rating The used autoclave is not rated for vacuum. A National Board Alteration must be completed on the autoclave before it can be used under vacuum to process your product. An external pressure (aka vacuum) rating is included during the design phase of the new autoclave. Autoclave supports Used autoclave supports do not meet the required load rating for the product to be processed in the autoclave. More supports will need to be added, which requires a National Board alteration, and additional loads on the foundation that will support these. Can your existing foundation support this? Supports are designed to your load requirements with the minimum number of supports required. Autoclave interior tracks (rails) Used autoclave tracks do not work with existing facilities equipment. The existing tracks must be replaced. The new autoclave is designed to match your existing facility equipment requirements. Autoclave useful life Used autoclave useful life will be determined by the amount of corrosion allowance left in the autoclave materials. Typical useful life of a new autoclave is 15-50 years, depending on the process requirements of your product. You can choose to buy a used autoclave, but don’t expect it to be an easy process. 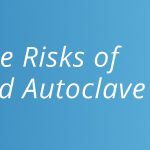 There’s a lot you’ll have to think about regarding the rules and regulations that govern autoclave usage in your state. You may find that buying new is the smartest choice with a lot fewer steps involved to know you’re getting exactly what you need. Note: Within this document, you’ll see frequent use of the word “autoclave.” An autoclave is an ASME Code pressure tank (vessel) that has a door instead of a dished head on one end of the tank. All ideas also apply to any used ASME Code tank you may want to use at your facility.